Air conditioning units control the temperature, humidity and ventilation of the air inside the building providing year round climate control by keeping rooms cool in the summer and providing warmth in the winter. At McCulloughs Ltd we are committed to providing energy efficient air conditioning systems. We can provide advice, supply, install and provide air conditioning servicing options that will suit your specific needs. We can advise you on which system is more beneficial to you from ceiling cassette units, wall mounted to concealed systems. We can also advise if you should have a split, multi or Variable Refrigerant Flow (VRF) system depending on your requirements. We are not committed to one manufacturer so can find the right system for you from leading manufacturers such as Mitsubishi Electric, Daikin, Fujitsu and Samsung. We have a specialist team who will design a kitchen ventilation system based on air flow calculations determined by your cooking equipment. 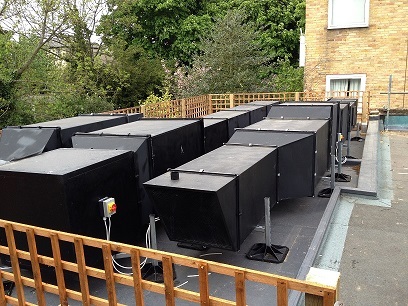 Bespoke stainless steel extract, supply fans and canopies are manufactured in-house by our highly skilled team to airflow rates governed by DW172 system design criteria, and includes a gas interlock system. 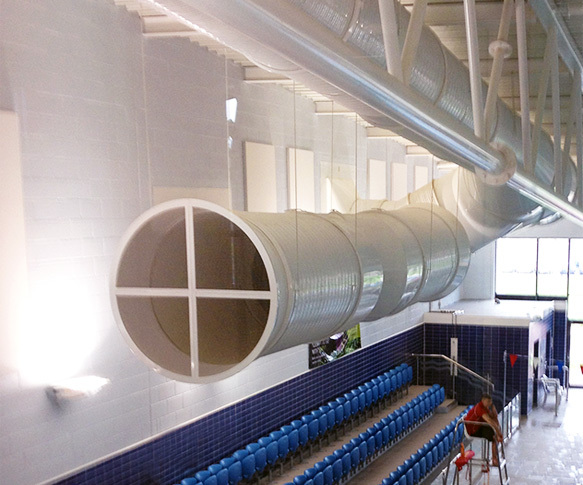 We supply and install both spiral and rectangular ductwork for ventilation systems. We also manufacture rectangular ductwork to DW144 specifications. We supply and fit air sanitisers that deodorise and sanitise the air by destroying harmful bacteria, viruses, pollen and fungal spores. If we install your air conditioning or ventilation system we can provide an on-going servicing and maintenance programme to keep your system running smoothly. By choosing this option you may even be able to increase your standard warranty. Please ask us for details. As well as design and installation of new systems we also service and repair existing systems. As we have our own workshop we can produce bespoke ductwork, filter houses and canopies. We design, manufacture and install galvanised steel ductwork to DW144 specifications and stainless steel kitchen canopies to DW172 specifications. If you prefer to buy your duct supplies and arrange installation yourself we can cater for your needs. Send through your drawings and measurements to shop@mcculloughs.co.uk and we can provide you with a quote. We can offer a comprehensive service: design and fabrication to installation and commissioning of a system to meet your requirements. We also provide a full range of air conditioning servicing options. We have a team of experienced F gas certified engineers, a City Guilds qualified draughtsman, a manufacturing team and a Project Director to see your project through from start to finish. Although we are not committed to one manufacturer we are accredited installers for Mitsubishi Electric and we are also a Daikin D1 approved installer. Contact us on 01638 666489 for further information or to arrange a survey.